The photos isn’t great, and I haven’t blocked it or added a button yet, but I am really pleased with it. It’s a top down seamless pattern which uses DK weight yarn. I used about 225g of New Lanark DK weight Donegal Silk tweed. The stitch pattern is the same as I used for the one row lace cowl. 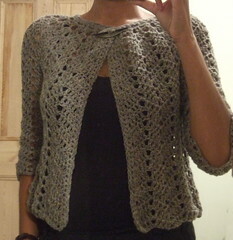 I found this cardigan on Ravelry. It is very beautiful. I will keep my eyes open for when the pattern is available. This is so nice. I love it already. I can see it in something warm, but lightweight like a silk blend or alpaca. But wouldn’t it be nice next summer in a cotton bedspread weight or baby yarn. Looking forward to seeing it here. Love this design. I found your cowl on ravelry and made one up yesterday. I am looking forward to this pattern. Thanks for posting your designs. I love your design! I would definitely make that one. The sweater is so pretty! I would love that for work. Thank you for the pattern! It’s on my to do list. Wish that 3 hour one was crochet… oh well. Stunning! Thank you for the pattern. You did a fabulous job. Great Cardigan. I think it looks great on, and almost looks like a different sweater completely on the hanger. Great job, I can’t wait to try it! Thanks for posting it. Also saw this on Ravelry and am excited to try it once the top down pattern is written up. Thank you! Very elegant! Beautful! Love your pattern. Very easy and attractive. It took me more than 3 hours 🙂 but not too much more. Thank you. I love this pattern, I have it in my queue on Rav. It is gorgeous! Thank you..